Save Time And Money During Installation And Down The Road. For the first time, Meritor standards of quality, performance and durability are available in the Meritor FastSet No-Ream King Pin Kit, which makes the aftermarket installation and repair of front steering axles faster and easier than ever. Isn’t that what you expect from a leading OE axle manufacturer such as Meritor? 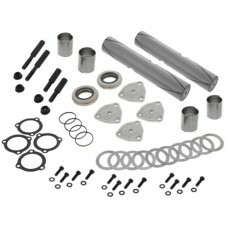 With the FastSet King Pin Kit, king pin bushings do not need to be reamed after they are installed into the steering knuckle, which saves labor, time and costs. 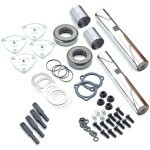 The kit eliminates the need for reamers, presses and pressing-in bushings during installation. The FastSet King Pin Kit is designed so that spiral bushings are easily installed by hand using the FastSet T-Handle tool. The T-Handle tool fits all FastSet spiral bushing sizes. Plus, there is a groove pattern in the king pin itself that makes it easy to install and provides better lubrication. In fact, the aftermarket kit eliminates so many labor steps and special tools that it significantly reduces fleet and owner-operator installation and maintenance costs. The Meritor FastSet King Pin Kit is designed, engineered and tested to deliver the durability that only metal-to-metal componentry made to Meritor-quality specifications can achieve. The kit installs easily by hand with the FastSet T-Handle bushing tool. 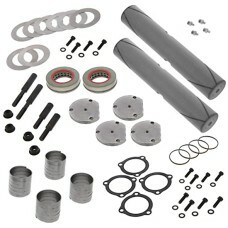 It is also easy to maintain, and is covered by Meritor’s standard aftermarket warranty of one year. The FastSet King Pin Kit is available in multiple pin diameter and length sizes to fit your application. Reference the charts below for the correct part number when ordering. See for yourself just how easy it is to install the Meritor FastSet No-Ream King Pin Kit by viewing the installation video. PART NO : AP9548G ..